One of the aspects of this sabbatical I fretted over the most was what to do about transportation for the year we would be in Costa Rica. If we were going to have a car, it was important that it be even more reliable here than back home in Pittsburgh. I was haunted by images of us being broken down on the side of the road in total darkness, with rain pouring down, and no entity like AAA to call for assistance. Is it possible to live here without a vehicle? Yes. But given the fact that one of our main objectives was to visit different regions of the country (and bordering countries as well), we felt like a car was a necessity. Not to mention the fact that it’s convenient to have a car for taking kids to school or to complete chores like grocery shopping. Our options were pretty simple. We could lease a car for a year, ship a car into the country, or buy a car in Costa Rica. Before doing any research, I figured the answer would be a no-brainer. Leasing had to be the way to go, right? How expensive could it be? Well, as we found out, it is really expensive. To rent a subcompact car on a monthly basis, we were looking at a cost of about $700-$800 per month. Spending $9,600 in one year on car lease payments alone didn’t fit within our budget and seemed to make no sense. Thus, I thought the next best thing might be shipping our well-maintained, used car into Costa Rica. Sure, it needed 1 engine and 3 transmissions in the time I had it, but I loved this car nonetheless. As I mentioned in a previous blog post, I bought an Isuzu Trooper in 2000 and drove that car until 2014. It took some effort to determine how much it would have cost us to import that car (many of the sites are in Spanish and the prices are in colones), but eventually we reached a conclusion. Assuming I drove the car to Miami from Pittsburgh, I could have had it shipped from Miami to the port city of Limon, Costa Rica. In addition to freight charges, I would have had to address inevitable customs issues and pay import duties. The Costa Rican Tax Ministry bases its figures on the vehicle’s market value in Costa Rica, not on the Kelley Blue Book value. They assess one market value for the purpose of registration and a separate market value for the purpose of importation. In both valuations, every single feature of your car is taken into account, without much of a discount for the vehicle’s age or its condition. When I typed my vehicle into the database, the result told me that Costa Rica set the importation value of the Trooper at $4,412. Given the exorbitant import tax rates, the best way to think of how vehicles are taxed here is to view the duty as a luxury tax. Vehicles that are brand new to 3 years old are taxed at 52.29%, those that are 4-5 years old are taxed at 63.91%, and those 6 years or older are taxed at 79.03%. The objective of this structure is, in part, to keep old cars off the road. At a tax rate of 79.03%, we would have had to pay $3,486 in import taxes alone. Then, we would have needed to pay a freight company about $1,000 and a customs broker a few hundred dollars to clear the car through Limon. Thereafter, we would have had to get the car inspected, registered, tagged, and insured. As we began to add it all up, it seemed like we were looking at somewhere in the range of $5,000-$6,000 simply to bring the Trooper into Costa Rica. That didn’t even take into consideration the time and aggravation of the process. 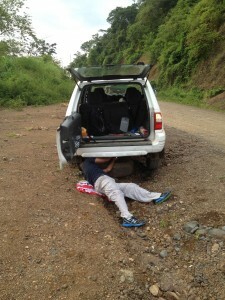 Oh, and did I mention that after we decided to move to Costa Rica, the Trooper transmission died anyway? So we would have needed to pay for a new transmission as well. All things considered, we opted to purchase a used car in Costa Rica. I wasn’t joking about the roads. Heather took this pic from our car. Buying a used car anywhere is a gamble, but purchasing one in Costa Rica is especially tricky. We had a few criteria. Knowing that Asian cars are quite popular here, we wanted to buy an Asian-manufactured vehicle so that getting parts wouldn’t be a problem. We had heard horror stories about owners waiting months for parts to come in. We wanted to avoid that situation. 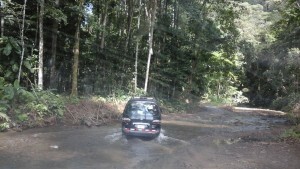 Also, it was important to us that the vehicle have good ground clearance. Although there are some nice highways in Costa Rica, many of the roads are treacherous. You might not need 4 wheel drive per se, but you definitely need something with a decent ride height if you plan to drive on mountainous, back roads. Given the propensity of objects to rust in this climate and the speed at which drivers drive on extremely bumpy and pothole-laden streets, we also did not want a vehicle that was too old. Obviously, this is a relative term. We reasoned something in the 2000s would be acceptable. At about $5.37 per gallon for regular, gasoline in Costa Rica is expensive. Ideally, we wanted to get something with good gas mileage. Last, we knew we needed to select a reputable mechanic. Since there didn’t appear to be the same type of formal training we have in the U.S., this was pretty challenging. Luckily, our neighbor connected us with a mechanic he has used for years. The Riteve sticker is on the top and the Marchamo sticker is on the bottom. After searching various websites and looking at “Se Vende” signs all around town, we opted to buy a 2000 Isuzu Rodeo. When Heather and I met, she drove a Rodeo and I drove a Trooper. 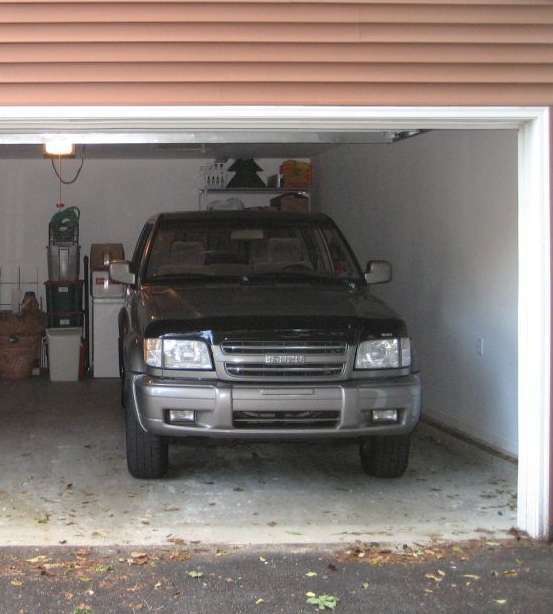 The only two people who owned Isuzus in the U.S. had discovered each other. We found it pretty ironic that we ended up buying the same exact vehicle in Costa Rica that she had when we first started dating in Pittsburgh. We knew to look for a vehicle with current Riteve and Marchamo stickers. 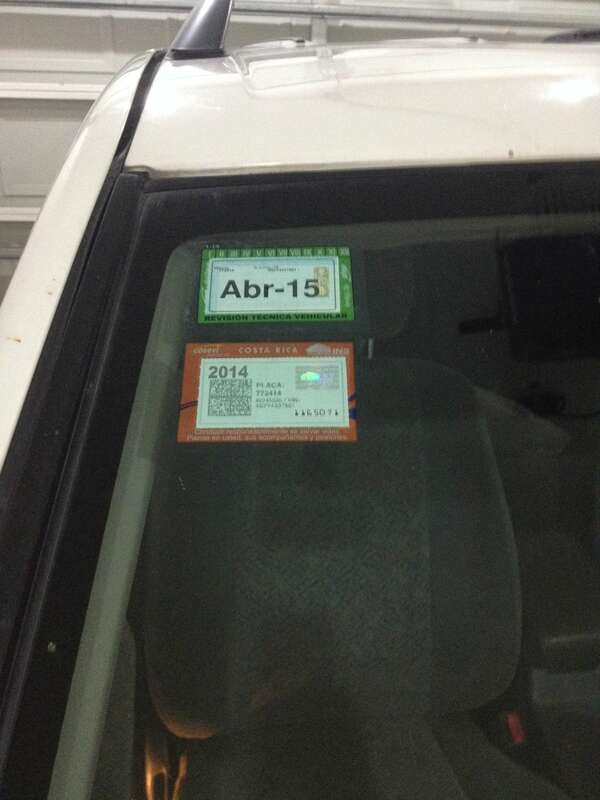 The Riteve is equivalent to an inspection sticker and the Marchamo is evidence of registration and liability insurance. Once we became familiar with the terminology, what seemed like a bit of a foreign process was actually pretty similar to how we do it in the U.S. We used the seller’s lawyer to complete the transaction. The lawyer ran a title search for us, which revealed the car had a lien on it. Once that debt was cleared by the seller, papers were prepared so that we would be buying the car with a clean title. The seller provided the original title (Titulo de Propriedad), both the seller and I showed proof of our identities via passports, a bill of sale was created (Escritura de Traspaso), and a new title and license plate were ordered. I had the vehicle titled in my name personally (some people in Costa Rica title them in the name of a company). We drove the car home the day of closing, and final, originals of the paperwork were sent to the lawyer a couple of weeks after the closing (which we picked up once they arrived). The seller, buyer, and legal assistant at the closing. The seller was a Canadian who was selling everything he owned, including the restaurant he recently opened, to fund his move back to Canada. Coming to Costa Rica ended up being a ruinous decision for him. More on him later. For now, let me take this time to mention what a trail of broken dreams Costa Rica can be. 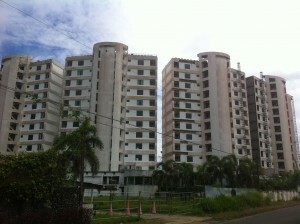 This is one of the stalled developments in Jaco. Depending on the expectations you have prior to your arrival and the decisions you make once you are here, Costa Rica can be a magnificent place. But, there are scores of expats who have had downright dreadful experiences here. In Jaco, this is best exemplified by the number of development projects that ended abruptly when the economic bubble burst. There are multiple buildings around town that are halfway built, or finished with no residents. And as for the residents in the Jaco area, we have met phenomenal people, along with a slew of quirky characters befitting of a Twin Peaks-like series. Jaco is a mix of locals, well-heeled weekend visitors from San Jose, vacationers from North America and Europe, retirees from North America and Europe, entrepreneurial-minded residents from North America and Europe, and people from all over escaping their past for one reason or another. I’m not judging, but I do seem to notice a trend of older North American and European men forming relationships with young, attractive Ticas. Here’s an example of their mindset. 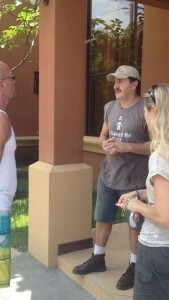 Heather was talking to a guy in his 50s at our pool. His exact words to her were, “I’d like to meet someone like you someday, except I’d like her to be 20 years younger.” At 42, she wasn’t sure if she should feel flattered by his statement or insulted. As I mentioned, we bought our car from a guy who had opened a restaurant with a Tica, only to have the relationship end badly and, thereafter, the restaurant too. I see him daily when I go for a run in the late mornings. He is still here, regularly drinking at the same bar. Yep. This place is indeed a trail of broken dreams. Our neighbor translating for us as we meet with our mechanic. In any event, after test-driving the car, we knew it would need some work, but the price was right. Don’t get me wrong, when I say “the price was right”, I mean the price was absolutely terrible for a 14 year old car. But it was a good price for Costa Rica. The only positive point about vehicles here is that the repairs are not that expensive. So we purchased the car and immediately turned it over to the aforementioned mechanic to have him install a new transmission, fuel pump, fuel filter, and shocks. We held on to our rental car during that whole period since we weren’t sure how buying the used car was going to turn out. The Rodeo with new plates. Of all of our established criteria, the only one we didn’t achieve was gas mileage. It undeniably gets appalling gas mileage. Otherwise, we’ve driven the Rodeo on many local excursions, as well as to Panama and the Caribbean coast, without any major issues. We plan on driving it either into Nicaragua or at least to the border of Nicaragua. So far, so good. 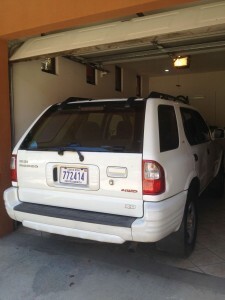 On the balance, is buying a used car in Costa Rica the right decision? It’s difficult to offer an accurate statement that applies to everyone’s situation. I would much rather have my Trooper since I obviously know its history. But we didn’t think paying for the installation of a new transmission made sense, given the other costs we would have incurred. Otherwise, that would have been a great car here. If you have an old vehicle that you’ve taken care of and that meets all of your standards, it might be worth going through the hassle and expense of shipping it to Costa Rica. If not, you probably should do what we and others often do here. Take a calculated risk and hope for the best. By the way, our mechanic is coming over tomorrow because both our “Check Transmission” and “Check Engine” lights just came on. I’ll let you know how that turns out. Pura vida. 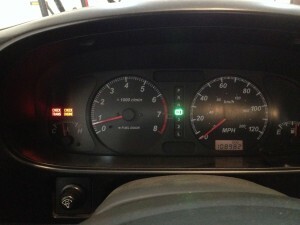 The Check Trans and Check Engine lights have begun to flash incessantly. There is an interesting characteristic about this car. Without a pair of pliers and the willingness to ruin one’s clothes, you can’t access the spare tire.